June 9th was the anniversary of Minority Leader Nancy Pelosi’s 25th year in Congress. 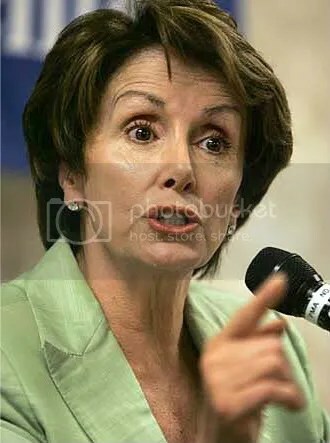 Nancy Patricia D’Alesandro Pelosi (born March 26, 1940) is the Minority Leader of the United States House of Representatives and served as the 60th Speaker of the United States House of Representatives from 2007 to 2011. She was the first woman to hold the office and to date, has been the highest-ranking female politician in American history. From Bayview to Bernal Heights, Chinatown to the Castro, the Mission to the Marina, and North Beach to Noe Valley, Congresswoman Pelosi has transformed San Francisco in her 25 years of service: preserving public lands and parks, expanding transit, protecting the Bay and the environment, and ensuring affordable housing. Nancy Pelosi, the Democratic Leader of the U.S. House of Representatives for the 112th Congress, is focused on strengthening America’s middle class and creating jobs. Democrats are working to protect the rights of America’s consumers, and ensure that our families and children are safe from toxic toys, food, and drugs. Democrats are building an economic approach that lifts every American, not just the privileged few. The average American CEO earns more before lunchtime in one day than a minimum wage worker earns all year. This is not the America we want our children to grow up in. Democrats stand up for economic growth plans that are fair, fast-acting, and fiscally responsible, providing opportunities for all Americans. Education is the cornerstone to building America’s future. We must make a national commitment to education by strengthening our schools, investing in Head Start, fully funding special education, and modernizing our classrooms. American ingenuity can be put to work to achieve energy independence from Middle East oil in the next 10 years. America can develop emerging technologies to process homegrown alternative fuels. Democrats are fighting for cleaner air, cleaner water, and preservation of our natural resources, understanding that what we do today has an impact on future generations of Americans. The 111th Democratic-led Congress changed the way Washington works to save taxpayers billions and restore responsibility. Access to quality, affordable healthcare is critical to the well being of America, today and in the future. As Americans we must protect human rights both at home and abroad—the right to live freely without the threat of violence or repression, the right to live with dignity and respect. The United States is a country made up of immigrants, and it is part of what makes us so strong and vibrant. And while immigration reform remains an unsolved challenge for our nation, we are committed to comprehensive reform. The best way to support our troops – in Iraq and Afghanistan – is to ensure that their sacrifice on the ground is matched with a clear strategy for victory and with the resources to get the job done and come home safely. Make it in America is a legislative initiative from House Democrats to revitalize manufacturing in America, create new good-paying jobs, and make our nation more secure. After years of the Abramoff scandal, special interests lobbyists writing legislation, and an explosion of earmarks, the New Direction Congress, the first Democratic majority in a dozen years, pledged to end an era of Congressional corruption and restore honest leadership and open government. And we took major steps to fulfill this promise. We have an obligation to care for and honor America’s servicemen and women, their families, and our veterans for their bravery and sacrifice. Democrats are keeping our promises to America’s veterans. From 2007 to 2011, Nancy Pelosi served as Speaker of the House, the first woman to do so in American history. Now that is a Do a Heck of Lot Congress. Strong, caring, and effective leadership … another reason I Vote For Democrats and why you should too.